I am so excited ... this weekend I going to visit my brother and his family, which means I get to meet my six week old nephew. It promises to be a lovely time of catching up with family, playing with my older niece and nephew, and sharing in the joy of a new baby. Of course, I can’t arrive empty handed and have had fun pondering what I can tuck into my carry-on bag. Bread travels well since it is compact and sturdy, and I’ve had my eye on a recipe for a chocolate loaf studded with chunks of chocolate and almonds. 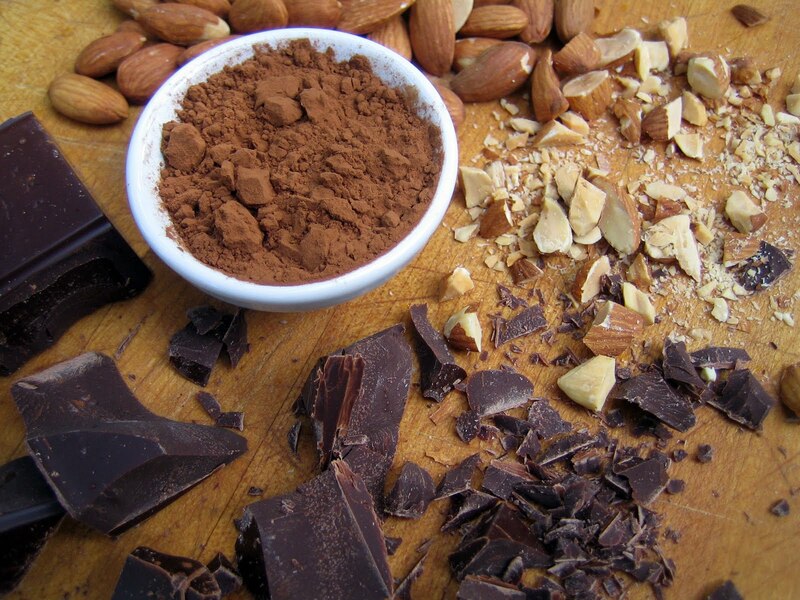 Chocolate and almonds pair so well together. 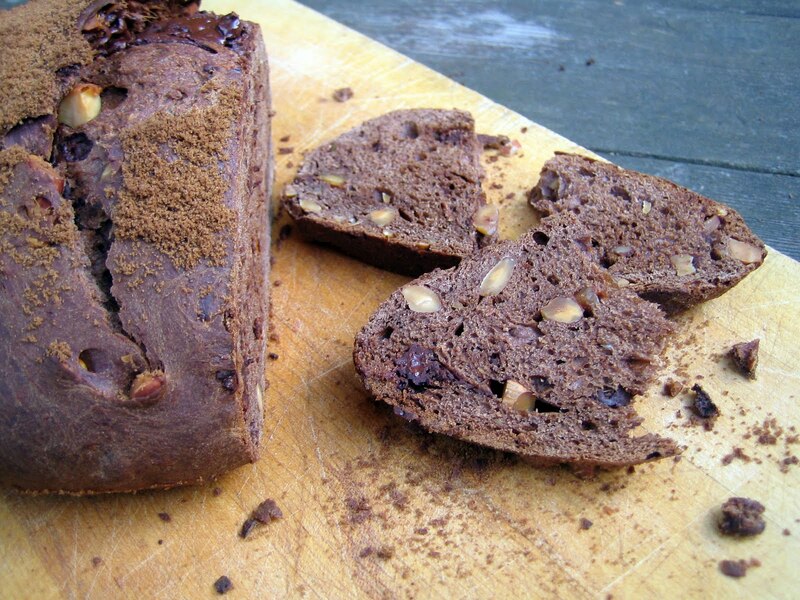 I love a good bar of dark chocolate with almonds, especially with a little sea salt added in, so when I spotted a recipe for chocolate almond bread in the Macrina Bakery & Café Cookbook (my favorite bakery in Seattle), I knew I had to make it. I added whole wheat flour, substituted almond milk, increased the chocolate and sprinkled salt on top, and am very pleased with the resulting bread. We sliced the chocolate loaf while still warm, licking the melting chocolate off of our fingers. I had planned to butter the bread, or spread slices with cream cheese, but we enjoyed it plain and almost consumed the entire loaf in one sitting. This is a hearty bread. The chunks of chocolate are decadent and the toasted almonds add wonderful crunch, while the cinnamon topping rounds out the flavors beautifully. Warm the almond milk slightly in a small saucepan. Sprinkle the yeast and 1 tablespoon of sugar into the bowl of your stand mixer. Pour the warm almond milk into the bowl and let sit for 5 minutes, until the yeast bubbles up. Add the remaining sugar, vanilla, eggs, cocoa powder, flours and salt. Using the dough hook, mix on low speed for a couple of minutes. Add the butter and increase the speed to medium. Mix for about 10 minutes, until the dough looks satiny. Add the chopped nuts and chocolate and mix for a couple more minutes. Place the dough in a medium sized bowl, cover with a clean dish towel and place in a warm spot to rise for about 2 hours (if my kitchen is cold, I preheat the oven on its lowest setting, then turn it off and pop the bowl into the oven and shut the door). Punch the dough down, remove it from the bowl and knead on a floured surface to remove air bubbles. Shape the dough into a ball. Line a baking sheet with parchment paper and place the bread on it. Let rise for 1 hour. Preheat the oven to 350 degrees. Stir together the cinnamon, brown sugar and salt. Sprinkle it on top of the loaf. Bake for 50-55 minutes. The loaf should sound hollow when tapped on the bottom. Let cool for 1/2 hour before slicing (if you can wait that long!). This looks to die for!! Wowzas. I LOVE Macrina bakery!! I went there like three days in a row when I was in Seattle in 2009 or 2010, can't remember. So good. Congrats on your baby nephew! So exciting. Thank you, Katherine! I'm so happy you've been to Macrina...I could easily eat there everyday. Please let me know if you're ever in Seattle again - it'd be fun to go there (and lots of other places!). I just ate breakfast and now I'm hungry again! Anyway, have fun with your family this weekend! No. Way. This looks astoundingly good! 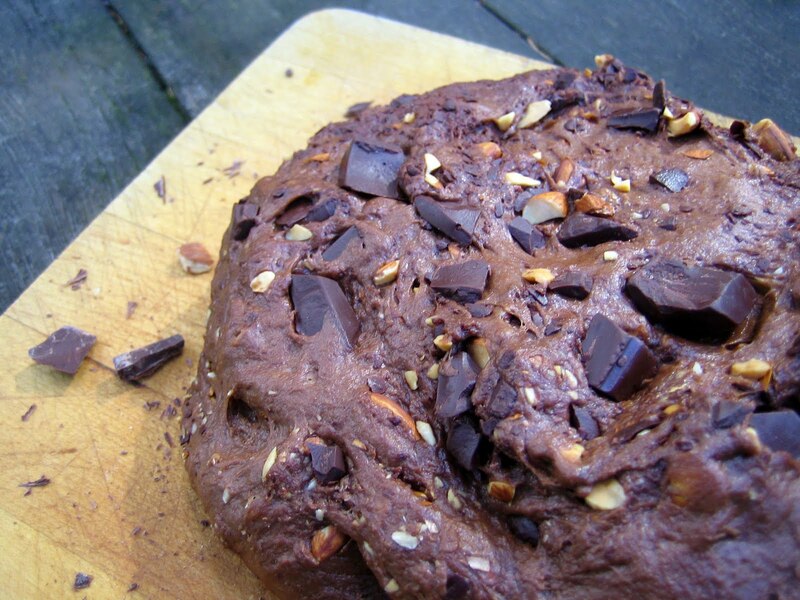 Home made bread, with chocolate, almonds, and cinnamon. What more could a girl ask for? Oh, this looks so good. 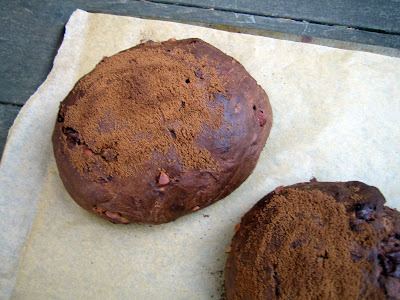 I've never made chocolate yeast bread before. Thank you, Lauren! I just got home and had a marvelous visit with my family. There is nothing like snuggling with a baby - pure happiness. Aw, thank you, B! I hope you enjoy the bread! Thank you so much, Katherine! It was such a wonderful surprise to return home last night and see your post. Big smiles here! This recipe looks fantastic. I want to make it right now. Hannah you say use all purpose flour. Just checking you don't mean bread flour? Hi Janby - I used all-purpose flour (not bread flour) and whole wheat flour here. The original recipe calls for using only all-purpose flour but I like getting more whole grains into my baking when possible. If you have bread flour on hand, I think that could work ok, too. Let me know how it turns out, and I hope you enjoy it!